- "Sit, Stay. Act: Diary Of A Dog Actor"
- Underdog Original Cartoon Episode "Safe Walf"
It's a bird, it's a plane, it's a frog...no it's Underdog - a flying, talking canine caped crusader! After an accident in the mysterious lab of mad scientist Dr Simon Barsinister, an ordinary beagle named Shoeshine finds himself with extraordinary powrs and the ability to talk! Armed with a fetching superhero costume, Underdog vows to protect the beleaguered citizens of Capital City and in particular, a beautiful spaniel named Polly Purebred. When a diabolical plot by Barsinister and his overgrown henchman Cad threatens to destroy Capital City, only Underwear...(oops! )...Underdog can save the day. You might forget the name but you might recall a certain image of a talking dog with superhero powers back in your childhood. From an adult’s point of view, “Underdog” is just another silly “talking animals” genre. Remember “Babe” or “Charlotte’s Web”? Okay maybe the latter is not exactly silly. “Underdog” is a beagle named Shoeshine that accidentally acquired super powers (think Superman on all fours) after an evil genetic scientist by the name of Simon Barsinister (Peter Dinklage) injected him with a dosage of weird serum. Knowing that the experiment is a success, Barsinister wants the escaped beagle back after it escaped in a panic and order his fumbling assistant to track and retrieve the dog. 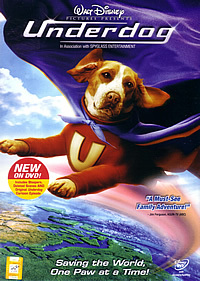 As with any friendly Disney family movie, the story has it that “Underdog” is shortly adopted by a security guard (Jim Belushi) as a gift to his teenage son Jack, the single parent has a hard time communicating with his son after he quit his job as a cop after his wife died. In the meantime, Jack starts to bond with “Underdog” without realizing it possessed super powers. On the other hand if you watch “Underdog” through the eyes of a little kiddo, this Disney feature isn’t all that bad. It has huge believable effects sequences with Underdog smashing through walls, glass without suffering a scratch, traditional family values, gags, funny poop jokes and parodies of Superman. Unlike some snobbish film critics, we do not simply resort to slamming a commercial movie thus we present to you two sides of the story. “Underdog” is the perfect antidote to a night of good old family entertainment, the perfect chance to impart healthy family values and also teach the kids why they shouldn’t behave the way the baddies did however if you are a single adult looking for some home entertainment, I suggest you skip this. The extra features begin with a series of Deleted Scenes with optional commentary by director Frederik Du Chau. Sounding overly enthusiastic at times but still well, I kind of liked one particular scene with Underdog freezing up in space. Worth a peek. There’s a short feature on Never-Before-Seen Bloopers followed by a MTV Performance by Kyle Massey. "Sit, Stay. Act: Diary Of A Dog Actor" takes audience behind-the-scenes in this roughly six minutes feature narrated by Jason Lee. In addition, it comes equipped with a “dig deeper” interactive feature which kids will love. A five minutes Underdog Original Cartoon Episode "Safe Walf" rounds up this code 3 DVD. Presented in Widescreen 2.35:1, the visual quality is sharp and clean however some of the poorly done effects do not hold up to the pristine quality of the video. On the other hand, kids won’t be particularly bothered by these minor quips though. Audio is on the weaker side, the bass only seem to perk up towards the end and the beginning. Dialogue is clear and not really an issue.